Excel VBA allows the user to make macros that automate processes within Excel. VBA macros are as strong as the user’s ability to code the macros using the Visual Basic language. The best way to learn to design your own Excel macro in VBAVBA MacrosSetting macros in Excel VBA is fairly simple. The structure for Excel VBA macros involves starting with a sub() line before beginning the macro code. Macros use the Visual Basic Application in Excel to create custom user-generated functions and speed up manual tasks by creating automated processes. is just to jump right into it. Naturally, you’ll need to know how to enter the VBA editor and set up the macro, how to declare variables, and how to reference data. This guide will use Excel VBA examples to ensure you know how to record your own macro! For this example, let’s assume we have the following data table. We are going to try and insert data into the cells to complete the table. For the purpose of this exercise, we are going to create a macro that will perform a function that can easily and more quickly be done manually. However, creating this macro will allow you to see how to write a macro, and the general logic behind VBA programming.Excel VBAVBA stands for Visual Basic for Applications. Excel VBA is Microsoft’s programming language for Excel and all the other Microsoft Office programs, like Word and PowerPoint. The Office suite programs all share a common programming language. As you can see below, Turtle Dove and Capital Inc. do not have their stock prices yet. We want to fill this in. Turtle Dove has a stockStockWhat is a stock? An individual who owns stock in a company is called a shareholder and is eligible to claim part of the company’s residual assets and earnings (should the company ever be dissolved). The terms "stock", "shares", and "equity" are used interchangeably. price of $92.17. 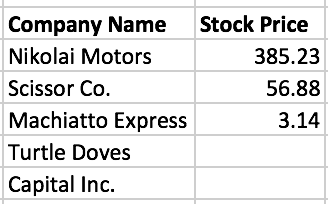 Surprisingly, Capital Inc. has the exact same stock price as Nikolai Motors right now. To learn more, launch our online Excel VBA Course! To begin creating the macro, we open the VBA Editor by pressing Alt + F11. The first step in creating a macro is naming the macroVBA Cell ReferencesVBA cell references allow the user to tell Excel where to look for the data it needs. After creating the macro and declaring the variables, the next step is to create VBA cell references, which actually refer to each variable and that can then be used to manipulate the data within the Excel sheet., as shown below. We’ll name the macro Stock Pricing. The very top of every macro should contain variable declarations. We are going to be using one variable here to store the value of Nikolai Motors stock price. Let’s name this variable Stock Price. Recall that the generally accepted naming convention for variables is to use lower caps if there is only one word, and to introduce every word after the first with a capital letter. Stock Price would be written as stockPrice. Now that we’ve created the stockPrice variable, we want to store a value in it. The macro now has two processes to perform. It creates a new Single variable (a number data type that allows non-integers) named stockPrice. Next, it stores the value found in Cell C4 to the stockPrice variable. Finally, we can use the variables to complete the process we need (filling in the stock price). We need to tell ExcelExcel for BeginnersThis Excel for beginners guide teaches you everything you need to know about Excel spreadsheets and formulas to perform financial analysis. Watch the Video and learn everything a beginner needs to know from what is Excel, to why do we use, and what are the most important keyboard shortcuts, functions, and formulas to use the stored value and place it in the appropriate cells. After storing the value, the macro will now use the variable to fill in the table. First, it will write the value stored in stockPrice to the Cell C8. Next, it will write the directly assigned value of 92.17 into Cell C7. Both methods work. You could also skip the variable and assign the value of C4 directly to C8. This is demonstrated below. As you can see in this macro, no variables are used. Instead, data within Excel is directly copied into a different cell. The macro will fill Cell C8 with the value found in C4, since macros read from left to right. Next, it will fill Cell C7 with the number 92.17. IBESIBES EstimatesThe IBES or Institutional Broker’s Estimate System is a database created to provide forecasted future earnings of companies that are publicly traded.